Over the years, I’ve heard almost every imaginable complaint and concern about writing college application essays. Like most common fears, they are almost all in your head. That doesn’t mean they don’t feel real. But if you can realize that a lot of your success will depend on not psyching yourself out, and staying calm and focused, you can then get to work. Map out a writing plan. Pound out a rough draft. Click logo to visit Home Page! 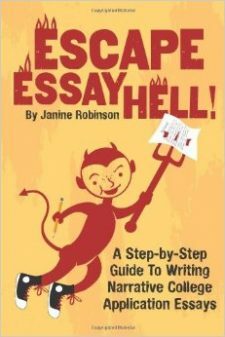 As a professional writing coach, I help students, parents, counselors, teachers and others from around the world on these dreaded essays! Learn to Write Your Essay in One Hour! Perfect for The Common App, UCs, grad school, transfer and scholarship essays! Buy Course for $99 and Start Now! What Makes a Great Essay? Click book image to learn about all four of my popular writing guides!